For the first time in the United Kingdom cities will have local television stations. But can they emulate the success of American local TV? The UK government decided against setting up a national “spine” of programs for local stations to build their schedules around, as ministers feared it would effectively turn into another national TV channel. Also, potential local TV operators were fearful of being dominated by a commercial national network operator with its own priorities. The Office of Communications (Ofcom), is the government-approved regulatory and competition authority for the broadcasting, telecommunications and postal industries of the United Kingdom. Local Digital Television Programme Services (L-DTPS) are individual services broadcast in specific local areas on Freeview (DTT) via the local television multiplex. The BBC will be forced to hand over £25m (US $38.15m) to the private sector after it lost the race to run the backbone of the 19 new local television stations planned for launch across Britain. Comux won the contract to build the infrastructure. Ofcom, which awarded the licence, said it thought Comux would be “reliable” and speedy at getting the television infrastructure up and running as soon as possible, so that the planned network of local television could launch. These new stations would not only be competition for the BBC’s own local news, the expansion of which Ofcom prohibited a few years ago, but would cost the corporation financially: it would have to provide £25m a year to cover the new stations’ engineering and transmission costs and, for the first 3 years, spend an annual £5m (US $7.63m) buying content from them. ITV has already scaled back its regional news offering, and the BBC abandoned plans for a local video news service. 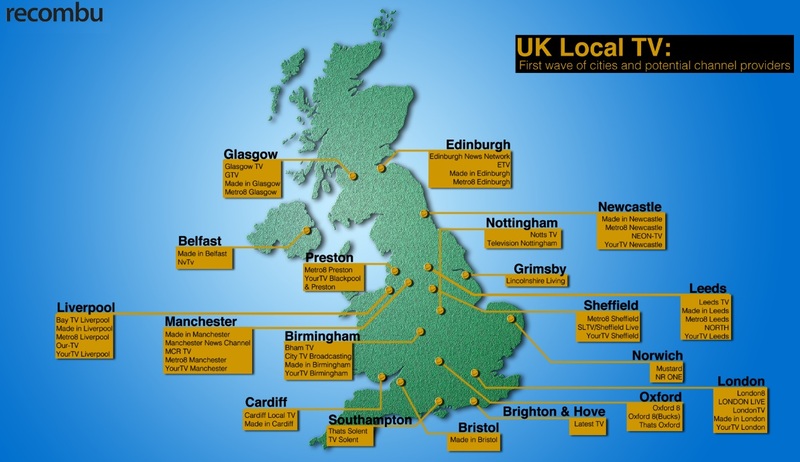 Plans were made for major cities in the United Kingdom to be the first cities to have their own local TV stations, similar to the way the United States cities have their own local stations. The first ‘pioneer’ areas include Belfast, Brighton and Hove, Cardiff, Glasgow, Grimsby, London, Liverpool, Manchester, Newcastle and Swansea. The locations were whittled down from 65 towns and cities which applied earlier. The government had earlier revealed the 65 areas where it will be possible to free up digital TV spectrum to launch the local media ventures. Residents of 3 of the 15 biggest UK cities – Bradford, Leicester and Coventry – will not be eligible to receive local TV, nor will parts of other sizeable towns including Hull, Wolverhampton and Portsmouth. Smaller towns including Derby, Peterborough, Canterbury, Worcester, Durham, Chester and Exeter will also be ineligible. The BBC has said that it will launch 5 new free HD channels by early 2014 on all digital TV platforms that carry HD in the UK. The channels will be HD feeds of BBC News, BBC Three, BBC Four, CBeebies and CBBC, with the news following Ofcom’s announcement today that it is creating new capacity for up to ten high definition terrestrial channels to go live in the UK. “The new channels will broadcast the same programmes as their standard definition equivalents in HD, giving viewers access to a further 250 hours of HD programmes per week than is currently available from the BBC,” the broadcaster said. What sets the United States apart from the other nations involved with television development is the fact there were several competing companies with no governmental financing involved. In Germany, United Kingdom, France and Russia there were single run government run stations in each country. The United States had a total of 9 local television stations on the air shortly before and during World War II. There were 3 in New York City, 2 in Los Angeles, 2 in Chicago, 1 in Philadelphia and 1 in Schenectady NY. BBC One is the national flagship general entertainment channel in the United Kingdom. BBC One shows uninterrupted programming without commercial advertising. It began broadcasting in high definition (HD) in November 2010. BBC Two is the second television channel operated by the BBC and is therefore commercial-free. It was Europe’s first television channel to broadcast regularly in color in 1967. It began broadcasting in high definition (HD) in March 2013. BBC Three has shows that targets those in the 16–34 year old age group. That station began in 2003. BBC Three has a unique 60 Seconds format for its news bulletins. BBC Four wass launched in 2002. BBC Four offers a wide variety of programs including: drama, documentaries, music, international film, original programs, comedy and current affairs. It is required by its licence to broadcast at least 100 hours of new arts and music programs. BBC Parliament broadcasts live and recorded coverage of the House of Commons and House of Lords, Select Committees of the UK Parliament, the 3 devolved assemblies – the Scottish Parliament, the Northern Ireland Assembly and the Welsh Assembly, and occasionally from the General Synod of the Church of England. The channel also broadcasts reports from the European Parliament. ITV is a commercial public service TV network in the United Kingdom. Launched in 1955 as Independent Television under the auspices of the Independent Television Authority (ITA) to provide competition to the BBC. Channel 4 is a public-service television broadcaster which began transmission in 1982. Although largely commercially self-funded, it is ultimately publicly owned. The channel was established to provide a 4th television service to the United Kingdom in addition to the television licence-funded BBC’s two services and the single commercial broadcasting network, ITV. British Sky Broadcasting (BSkyB) is a satellite broadcasting, broadband and telephone services company headquartered in London, with operations in the UK and Ireland. BSkyB is the largest pay-TV broadcaster in the UK and Ireland. Jeremy Hunt is a Conservative Party politician, who is the Secretary of State for Health, and the Member of Parliament for South West Surrey. He was previously Culture Secretary (2010-2012). The Secretary of State for Culture, Media and Sport (informally Culture Secretary) is a United Kingdom cabinet position with responsibility for the Department for Culture, Media and Sport. Licenses have been issued to run local TV channels in 21 locations over a 12-year period, where media regulator Ofcom believes it’s both technically possible and there are enough people to create a market for advertisers to fund them long-term. Aberdeen, Ayr, Basingstoke, Bangor, Barnstaple, Bedford, Bromsgrove, Cambridge, Carlisle, Derry/Londonderry, Dundee, Guildford, Hereford, Inverness, Kidderminster, Limavady, Luton, Maidstone, Malvern, Mold, Middlesbrough, Reading, Salisbury, Scarborough, Stoke on Trent, Stratford upon Avon, Tonbridge and York. London is to have a dedicated free-to-air television channel for the first time. Ofcom’s Broadcast Licensing Committee (“BLC”)1 awarded a local digital television programme service (L-DTPS) licence on 29 January 2013. News will be one of six strands of programming at launch, including a commitment to 7 hours of current affairs programming each week and Set in London, which will be the home of acquired entertainment programming to boost peak and weekend viewing. London Live is also aiming to acquire dramas set in the capital. The channel is also promising at least 42 hours a week of “quality content created by Londoners for Londoners”. London Live will have about 50 full-time staff responsible for content creation, moderation, programming, marketing and ad sales. Based in Birmingham, City TV is a local commercial television channel. Its ethos is about strengthening local identity, local opportunity and the local economy. Its character will be fresh, innovative, informative, creative and entertaining. The station will be focusing on local news and current affairs which includes business news. We will also have a schedule of local arts, entertainment and lifestyle programming and local sports programmes balanced with acquired, commissioned and advertiser-funded programming. City TV coverage area includes the 1.2 million households in the greater conurbation of Birmingham, parts of Solihull, Wolverhampton, Walsall, Dudley – who have access to Freeview. Our coverage will include hyper-local content from each of the 10 constituencies (40 neighbourhoods) in Birmingham as well as content from the general footprint of the Local Enterprise Partnership. City TV is mapped across the Greater Birmingham Enterprise Zone and this will have links into news/activities around regeneration and new industries. The mapping also covers the geography of the Greater Birmingham Chamber of Commerce which is highly supportive of the need for extending local media and local programming. City TV intends to operate 24 hours / 7 days a week. Some programming will be original but we will also have repeats, omnibus and revenue-generating programmes such as teleshopping. In 2012, Northern Visions won the bid to Ofcom for the licence to broadcast local television in Belfast. The service, to be broadcast on Freeview, will provide local news, current affairs, a wide range of creative, educational, entertaining programming and widen the community’s involvement in broadcasting by encouraging active citizenship in making programming, inclusive of all under-represented communities. Northern Visions is a non-profit distributing company limited by guarantee. Since 2002, Northern Visions (NvTv) has been licensed by Ofcom to deliver local TV for Belfast. The service was originally broadcast on analogue until digital switchover in 2012. The new digital service, NvTv, will be broadcast on Freeview. It is planned to commence in 2014. Available to a minimum of 200,000 local households, viewers will be able to receive this distinctly Belfast service by pressing Channel Number 8 (located between BBC3 and BBC4), on their Freeview remote. A website is currently being developed for the new local television station. YourTV Manchester is a brand new television channel coming to your screens in 2014 featuring everything that’s best about Manchester as well as the latest news and debate on everything that matters to you. YourTV Manchester will also show a wide range of programming from programmes for children and teenagers; to programmes showcasing local bands and other artists to business and educational programmes. YourTV Manchester will be on Freeview channel 8 and you’ll also be able to catch up with your favourite programmes online and on your mobile. MADE Television was founded in 2009 with the sole aim of exploring the viability of creating local television stations in the UK. Station Manager Isi Abebe will be responsible for the day-to-day running of the new Local TV service for Leeds – Made In Leeds, when it launches this Autumn 2013. Bay TV Liverpool is an internet protocol television station (IPTV) that launched in November 2011. Operated by a completely independent company, based in the city, Bay TV Liverpool delivers a constantly-expanding menu of programmes and commercial content to an audience hungry for truly relevant local content. Ofcom has awarded a local TV licence in Southampton to That’s Solent TV, an application backed by Newsquest and Johnston Press. That’s Solent was the 9th to be accepted by the media regulator since the application process closed in August 2012. That’s Solent TV said it will broadcast 3 hours of news on weekdays and 1 hour a day at the weekend. The station will transmit 108 hours of content per week, including news, sport, arts and business content. It will initially employ 3 news editors, 3 reporters and 7 junior reporters. Made In Tyne and Wear TV has been awarded the licence for local television in Newcastle. The licence means the station has won the right to broadcast to some 900,000 households in the Newscastle area. Made in Tyne and Wear will work in partnership with Trinity Mirror’s regional title The Newcastle Chronicle. Made in Tyne & Wear will be focusing on local programming by and for local viewers. In 2014 residents of Nottingham will able to tune into Notts TV on Freeview Channel 8. For the first time Nottingham will have its own TV station dedicated to bringing a range of quality programmes to your homes. Notts TV has been awarded a 12 year licence to broadcast a TV channel on Freeview Channel 8, launching in early 2014. Notts TV will transmit on Freeview seven days a week initially 4pm to midnight, and then from earlier in the day as more programming becomes available. The launch date is yet to be confirmed, but the provisional dates are January 2014 for rehearsals, and April 2014 for the launch of the channel on Freeview. The programmes will be produced by a dedicated team set up to run the channel, by the Notts TV consortium companies, and by local producers. We will start recruiting staff in September 2013. The channel will produce a commissioning guide for local producers. The consortium running Notts TV is the Nottingham Post, Nottingham Trent University, Confetti Media Group and Inclusive Digital. Notts TV will produce quality content that is directly relevant to the people who live, work and study in Nottingham and surrounding areas. Notts TV aims to build a TV channel that covers local news and produces an ambitious range of general programmes. Notts TV News will be journalism-led, and have a broad agenda, covering politics, business, sport, consumer news, the arts, weather and travel. The news will be produced by a team of Notts TV video journalists, will broadcast from a studio at Nottingham Trent University, and will have news headlines and interviews from the Nottingham Post newsroom. Sheffield Live – SLTV, the local digital television channel for Sheffield. Sheffield Local Television represents a consortium of Sheffield-based organisations launched on 11 February 2011 and led by Community Media Solutions Ltd (CMS), a Sheffield-based media development agency, and Cultural Industries Quarter Agency (CIQA), an urban regeneration and economic development agency with a focus on Sheffield’s creative and digital industries. Participants include Sheffield Live, Kinematic Media, South Yorkshire Film-makers Network, Sheffield Independent Film Training (SHIFT), Visualis, Sero Consulting, Sheffield Media and Exhibition Centre, Sheffield International Documentary Film Festival, Tramlines Festival, Studio of the North, Sheffield University, Sheffield Hallam University and The Sheffield College. The consortium has been supported by Sheffield City Council, Creative Sheffield and Sheffield City Region Local Enterprise Partnership. SLTV is now opening a first call for the submission of programme proposals for inclusion in its launch programme schedule. Latest TV has been awarded the licence for terrestrial TV in Brighton and Hove. At last Brighton and Hove will have its own television station with its own studios in the heart of the city at Latest Musicbar; broadcasting on Channel 8 on the Freeview platform with slots on other platforms to be confirmed. Latest TV will showcase the best of Brighton, Hove, Worthing and surrounding areas, and also to working with the BBC to provide up to the minute local news provision. With Wired Sussex, Latest TV will be a catalyst for growth in the crucial digital, creative and IT sector. TV would like to thank the past and present Secretary of State for Culture, Media & Sport, Jeremy Hunt MP and Maria Miller MP, the DCMS and all at Ofcom for realising the importance of local democracy. Ofcom awarded the first of a planned new generation of local TV licence to Lincolnshire Living in Grimsby. The license will be for 12-years. The licence was one of the first to be awarded in the local TV project championed by former culture secretary Jeremy Hunt, often in the face of widespread scepticism about whether the services will be financially viable. The channels will broadcast on a so-called multiplex, a small amount of spectrum reserved for local TV broadcasting on digital terrestrial television. 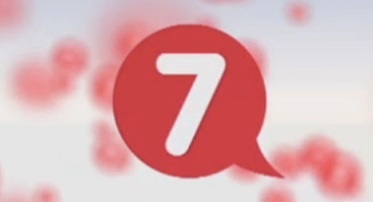 Lincolnshire Living is an extension of the Grimsby-based Channel 7 local TV service currently available on Virgin Media. BBC television transmission was suspended on the day that war was declared against Germany during World War II. When Germany invaded Paris, they took over the transmitter on the Eiffel tower and transmitted newsreels, and other programming for injured German soldiers in Paris area hospitals. The Royal Air Force set up a receiving system on the coast of England to watch the transmissions. On December 17, 1949, the transmitter at Sutton Coldfield became the first television transmitter to broadcast outside London and the Home Counties, bringing BBC Television to viewers outside of the south-east of England for the first time. It was the first time a president had been videotaped in color. WRC-TV, channel 4, is an NBC owned-and-operated television station located in Washington, District of Columbia. The first regular electronic television service in Germany began in Berlin on March 22, 1935, as Deutscher Fernseh Rundfunk (German Television Broadcasting). Broadcasting from the Fernsehsender Paul Nipkow, it used a 180-line system, and was on air for 90 minutes, 3 times a week. During the 1936 Summer Olympics, broadcasts, up to 8 hours a day. it was on air until November 1944.